A brief welcome from our Executive Director. The Church is alive and creating ripples of community throughout the Puget Sound area! These stories must be told! To assist with this process, we share these messages of “Awakening” in the first issue of our new Congregational E-Newsletter. We offer this as one more thread interweaving the lives of our congregations and The Church Council of Greater Seattle as we walk side by side on this long road to love and justice for all. In this quarterly publication, tailored specifically to congregations within The Church Council’s regional network, you will find four types of content. First, we will feature faith leader reflections from those driving this movement on an institutional level. 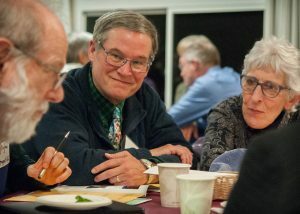 You will also find stories from congregations very much like yours as they discover challenge and hope, opportunities for transformation, and new encounters of relationship through this sacred work. We will also feature Organizer Spotlights that raise the voices of those moving throughout and between our communities carrying the threads of justice and collaboration that weave us all together, and a short list of Opportunities to Engage. 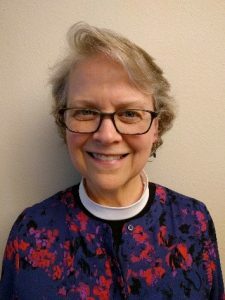 If you are moved by these stories and feel led to share your own, or that of your congregation, please feel welcome in sending an inquiry to Irene. We are blessed to walk this path with you; that which beams from your congregations illuminates our shared future as the coming light of spring. On a Tuesday afternoon early last September, an historic event occurred: The Port of Seattle Commissioners voted to lease Port land to the city of Seattle for use by a Tent City for the very first time. The residents of Tent City 5 had found a new home. A coalition of people and congregations worked together in a Spirit-inspired effort to influence this historic moment. The time had come for Tent City 5 to move from its site in Interbay. A group of 3 friends of TC5 from Magnolia – I call us The Owls (Old White Ladies) – scoped out land within a mile of the original site, but it belonged to the Port of Seattle. The Owls asked for a meeting with the former Director of Homelessness in the City of Seattle to discuss TC5’s move. 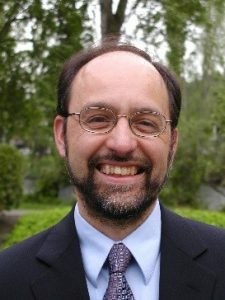 Much to our delight, he said, “Yes.” And then we looked at each other and said, “Now what?” Knowing The Church Council had been doing this kind of work for nearly a hundred years, I called Michael Ramos for strategy advice. In the meeting with city staff, we outlined our hope to keep TC5 in Interbay at the proposed Port site. The Port had never leased the city land for such a purpose. The city staff told us, “You have more power to influence the Port Commissioners than we do. Get organized!” The old white ladies looked at each other and blinked a few times (as owls do). Then, from the depths of my soul, I said, “We can do this!” I felt this with such assurance because of the Church Council’s foundational leadership in community engagement across this region; that history forms and transforms us. The day before the historic Port Commissioner’s vote, I visited TC5 at their original site. As I was leaving, I leaned down to greet a very young child whose family had recently arrived. Finally, this little one was in a safe place with her family. Finally, they didn’t have to worry about food. Finally, they had sustained support for re-building their lives. As she stood in front of me clutching a small toy, the look of bright and blooming hope on her face brought me to my knees. Hope and sustained support: this is what empowers people to thrive. 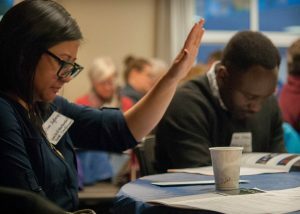 Maintaining the network of hope and support we put together for TC5 by keeping them in Interbay took the creative and collaborative contributions of hundreds of people, and 30 years of foundational work by our allies at The Church Council of Greater Seattle. I thank God for all of them, and for you. We can do this! As people of faith in 2018, you have read the signs of the times. You are developing the capacity of your congregations to give voice to the impacted people you have grown to see, know, and love. We have come together as people of multiple faiths to stand in the gap where immigrant brothers and sisters are cast further into the shadows and our Muslim friends are the subjects of dehumanizing travel bans. In this moment, we are more than 100 congregations forming a bridge together. These bridges are built of many smaller stories, like helping to co-convene a coordinated faith response to the social services budget cuts at the end of 2017. On December 6th I co-organized and co-convened an emergency meeting comprised of impacted people, advocates, organizers, church folks, and social service providers, in response to budget cuts which significantly impacted homelessness social service providers in the city. I expected about 20 people to show up to the meeting we planned. Instead, nearly 60 people showed up, most of whom I did not know. Afterward, many concrete action steps were quickly delegated and acted on. The results of that meeting saved several life-giving programs around the city. These concerted efforts are protecting and empowering lives all over the region. I see you as congregations connecting with your immediate neighbors and starting to recognize how strong we can be together. Whether it is the Weaving Our Strengths Conference or sharing resources to make racial justice a way of life, your engagement in the past year has been vital for our life together at such a time as this. The goal for this gathering is to connect faith leaders across denominational lines in order to strengthen our collective resolve in working to dismantle structural racism and white supremacy. The Church Council is committed to walking with congregations who wish to make racial justice a way of life. 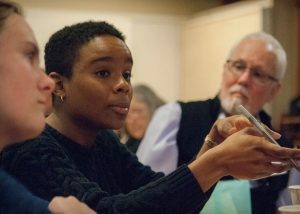 Our time together will provide an opportunity to share ideas and resources, offer support and encouragement, and foster collaborative relationships among the anti-racist faith community in Seattle. Question? Please contact Haley Ballast. The Church Council of Greater Seattle is partnering with 21 Progress and other immigration organizations on this accompaniment initiative. Volunteers will initially learn how to accompany people to their biometrics appointments at USCIS in Tukwila. If you are available during the day on weekdays and are interested in accompanying people to their immigration appointments, please join us to learn more. Speaking additional languages is helpful but not required. Location information TBA. Questions? Please contact Briana Brannan. The Northwest Detention Center (NWDC) is the region’s largest immigration detention center with 1,500 beds. It is owned and run by the for-profit prison corporation GEO Group. Detainees from across the NW are taken to the NWDC by I.C.E. where they are detained prior to deportation. Faith communities from across Washington and Oregon have come together for a vigil every Mother’s Day to remember the devastating impact the detention system has on families and to commit to another year of advocacy and organizing for another world where loved ones are not incarcerated and deported. Please email Paige if you or members from your faith community are interested in being part of a planning team with our partners from Interfaith Movement for Immigrant Justice (IMIRJ) in Oregon. The first planning meeting will be on Sunday, April 8th from 3:30-5:00 p.m in Renton or via Zoom video conference. This year’s conference will take place at Mercer Island Presbyterian from 8 AM to 4 PM. Workshop and programming details will be posted soon at thechurchcouncil.org! Photos from The Church Council’s Annual Assembly on March 22, 2018 by Ion Gardescu. Left: Church Council Board Member The Rev. Dr. Rick Russell engages with his table group about faith and justice work during a community conversation exercise. Center: The Rev. 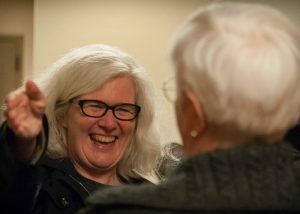 Maggie Breen, Church Council partner agency the School of Theology and Ministry at Seattle University, greets a friend at Annual Assembly Right: The Rev. Shalom Agtarap sits with other Assembly attendees in prayer.